OK, it actually happened in May but I'm still sidelined. I was walking into the back room, turned to go to the closet but kept my foot planted and then came the pain. I kept it bandaged well, took it easy at fencing practice, went to my final tournament of the season in Kingston, the Can/Am Cup and then decided to give it a long rest. A month later, after walking up and down stairs like a 90 year old man but still walking to and from work, I decided to give my knee a try. I walked up three stairs and on the third step felt like a knife was going into my knee. Time to give my physiotherapist, Lauren, a visit. She has mended me before and hopefully can again. She examined my knee and then sent me to a doctor so I could get an ultrasound and x-ray done. Thankfully the results came back negative so she has determined there is just a small tear in my meniscus. A small tear that is healable. What the heck is a meniscus anyways? "The menisci of the knee are two crescent shaped pieces of cartilage that rest on the top of the tibia. 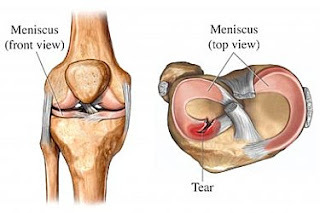 The medial meniscus is located on the inside aspect of the knee and the lateral meniscus on the outside. The menisci function to provide cushioning between the tibia below and the femur above, provide for equal distribution of weight on the knee joint, and allow for increased range of motion of the knee. The function of the meniscus is critical to the health of your knee"
Lauren has advised me to stay off my feet as much as possible. No more walking to work. No 5KM walks. No using the elliptical machine or arc trainer at the gym. Problem is that I have put on weight in the past half year and want to get it off. Without walking, my weight will continue to balloon! The solution? Lauren has given me exercises to do for my glutes. They are not working much as I walk stiff legged and she wants to keep them built up so they don’t waste away. I am allowed to use a stationary bike set to minimum resistance. As I am pigeon toed, I find my heel bangs the side of many bikes. I seem to have the best luck with the one pictured. She also recommended swimming. The YMCA has a pool and Aquafit classes so right now I am using a 2 week free membership which I will follow up with a full membership. I also have a summer of weekly appointments set up with Lauren. The ultimate goals ... have the knee healed and ready to go by September, be 12 to 15 pounds lighter and have a fun summer. Of course, I can do it! First Aquafit class at the "Y" is tonight. Update: Aquafit class was cancelled at the last minute this evening because the pool was closed due to a "pool fouling".